Thallus large, to 30 cm broad, irregularly lobate; lobes broad and rounded, rarely linear, tips often ascending, more or less shining, greenish gray to brown, greener when wet, reticulately ribbed or rugose, lacking isidia or soredia; lower side with pale naked swellings, separated by smooth, blackened veins, tomen-tum light-colored when young, rhizinae dark, to 4 mm long. Cortex 30-50 µ 5-6 layers of cells with large, 10 µ, lumina, algae green, cephalodia internal, numerous, appearing on the surfaces as swellings to 2 mm broad. Apothecia common on upper surface and margins, to 4 mm broad, margin with numerous protuberances; disk brown; hypothecium 60-110 µ, brownish; hymenium 95-113 µ, hyaline or brownish; epithecium reddish brown; paraphyses 1.5-2.5 not capitate; asci clavate, 90-llOx 15-21 µ; spores 6-8 per ascus, hyaline, usually 1-septate (-3-septate) fusiform-elliptical, straight, 21-34x6-9 µ. Pycnidia laminar and marginal, conidia 4.5-5.5 X 1-1.5 µ. Reactions: K—, medulla K—, KC—, P—. 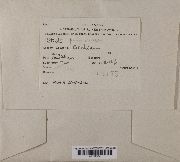 Contents: tenuorin, methyl gyrophorate, methyl evemate plus other substances and several linitins irregularly present (Maass 1975). 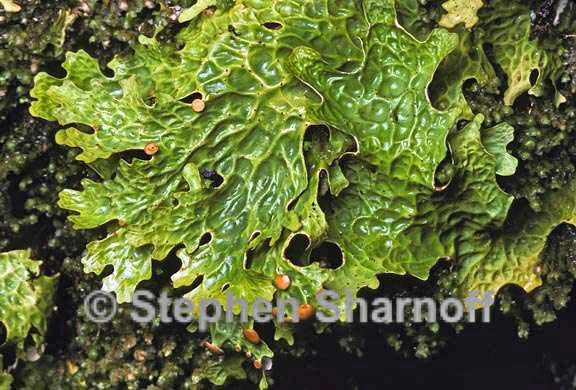 This species grows on tree bases, rocks or earth, often among mosses. It is circumpolar arctic and alpine. 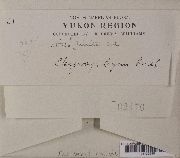 In North America it is mainly in the western part of the continent, from Alaska south to Oregon and east as far as the west coast of Hudson Bay.